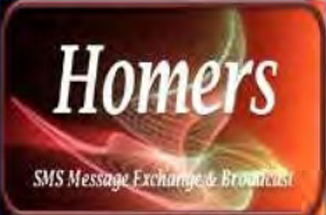 Homers is an automated text-messaging sending software with two way interactive communications between the computer software and the person who receive the text message. It can be used to send customized messages to small or large groups. 3 easy steps used to send group text messages, then automatically collect and process individual responses. Text messages are immediate and personal, less intrusive than a call to a cell phone. That’s why texting has become the planets’ single most popular way to communicate. It’s easy. First, the user must select the recipients from the contact list. Then, entering the text message; a text message can be any text strings including hyperlink. Finally, clicking “send now” or using the build-in calendar to schedule when the message want to be sent. That’s it! Homers great for event invitation, RSVPs or cancellation notices. Fast, simple, automatic customer satisfaction surveys. Quick polls, news alerts, or any messages that needs to be quickly and personally delivered. No other bulk text messaging tool enables you to automatically and interactively collect and process responses from recipients. Bulk text messages can be send by a single click with an automatic response processing, easy-to-use spreadsheet user interface. The user can build-in Message Designer for creating personalized text messages and a build-in calendar for advanced call scheduling. Import or copy-past call list from Excel and access files. By using Homers the user can recurring messages daily, weekly, monthly and yearly. What user needs to operate Homers? A desktop or laptop computer with Windows 8, 7, Visa, XP operating system. A text messaging plan from a GSM-based service provider. A GSM modem or a compatible smart mobile phone. The GSM modem supports a wide range of SIM card. It is possible that you can use your mobile phone with the SIM card directly.